A lineup of mininucs (plus Tony)! 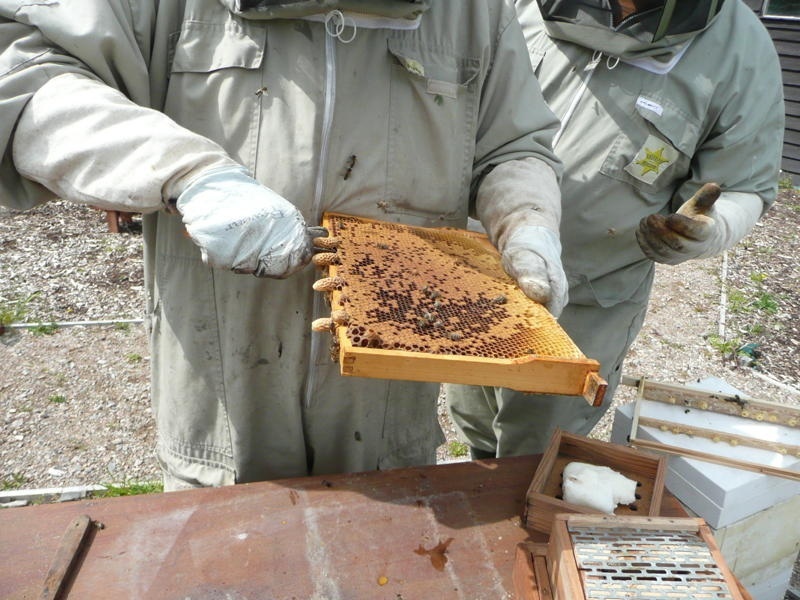 Last Wednesday we carried out the last stage of the process – dividing the sealed queen cells up amongst mating nucs. We didn’t get as many pictures this time as everything got a bit hectic whilst we were filling the nucs and all hands were needed. 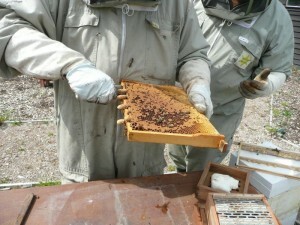 First we got all the mininucs ready for filling with bees. 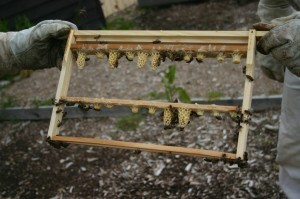 Then it was into the hive to see how many of our larvae had finally been accepted and turned into sealed queen cells. At this point we got a bit of a disappointment as it turned out that although the bees seemed initially to have accepted most of the grafted larvae they had only taken six to the sealed queen cell stage. It was probably my dodgy first attempt at grafting but hopefully better results next time. But there was a bonus in store for us when we went through the hive. The bees had decided to build a few queen cells of their own. So, not to let their efforts go to waste, we harvested the extra cells and gave one each to its own mininuc. And that was that. We spent a chaotic hour piling bees into mininucs and left them closed up in the shed. Tony went back to release them on Friday and all seemed well. 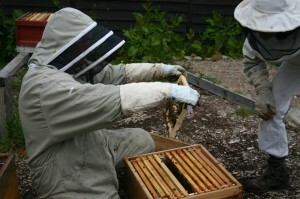 But by today (Sunday) two of the Kielers were empty of bees and their queens were dead in cell. Fingers crossed we don’t get any more casualties!